The Singleton Strikers had their first hit out for season 2017 in very hot, trying conditions at West Wallsend last Saturday. Season 2017 will see some changes to the First Division competition after a restructure by the governing body, Northern NSW Football. The two most obvious changes are the rebranding of the competition to the newly named Northern League One, and the addition of an U15 squad to the Premier League ranks. It was the U15’s who got the day under way with the 9:00am kick off meaning they enjoyed the best conditions of the day. And the new look U15 squad acquitted themselves well in their first game together. The young Strikers dominated early, and this early dominance was rewarded when midfield dynamo Cameron Neal slotted in a well taken goal. 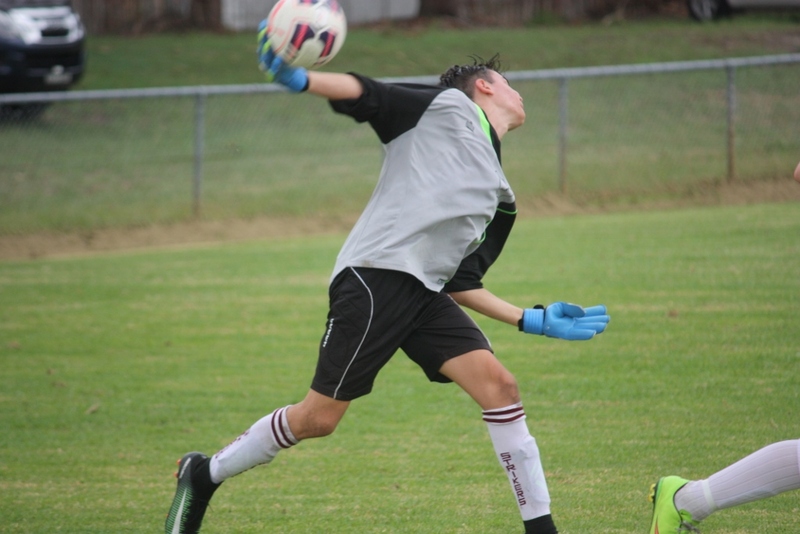 This stung West Wallsend into action, and Singleton had goalkeeper Tyler Morris to thank for keeping them in the game as he pulled off a string of top shelf saves to deny West Wallsend. But the home side was not to be denied, and they scored an equaliser at the 20 minutes mark after Morris had pulled off another parried save, but Singleton’s defence was napping and Westie attacker pounced on the loose ball. 10 minutes later Singleton were back in front when they were awarded a penalty kick which Jacob Geddes calmly stroked into the net. The second half was an evenly matched affair with both sides probing for a goal but not being able to take the right option in front of goal. Hardworking Singleton pair Jude Sansom and Marlow Court-Kriesh were particularly impressive during this period. In the shadows of fulltime, a tired Singleton pass coughed up possession and West Wallsend capitalised to score a late equaliser. But there was plenty to like about the 15’s performance, and was a very good first up effort. The U17’s game saw West Wallsend in immediate ascendancy. A shell shocked Singleton were 3 goals down after just 15 minutes – despite the efforts of ‘keeper Brae Wissink who saved a penalty kick – to save Singleton’s blushes even more. It took 20 minutes to settle, but finally Singleton started to play some football and the rest of the first half – including a goal to Braedon Rose – belonged to the Strikers. But the second half saw Westy add 2 more goals, both from long through balls which exposed the defensive frailty of Singleton’s U17’s, to bring up the final score of 1-5. Wissink in goals was impressive, as was the work rate of Harry Smith, who certainly put a shift in. The U19’s was a similar affair. 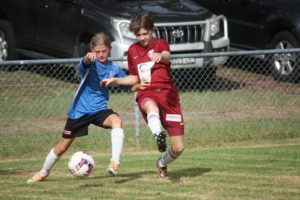 West Wallsend were champions in this age group last year, and showed why as they racked up 5 unanswered first half goals against a very lacklustre Singleton team. The second half saw Singleton put in a much improved performance – including a great penalty save by Brad Fairclough, and a well-earned goal to hardworking newcomer Callan Stubbs – but the final score of 1-7 was a fair indication of the gulf between these teams, and was hopefully a wakeup call for the Singleton 19’s who have been conspicuous by their absence at preseason training so far. By the time the U23’s kicked off at 2pm, the mercury was nudging 40, and a slow stop-start affair was the result. Singleton’s reliable goalkeeper Ryan Guihot carried on from where he left off from season 2016 with a string of fine saves early. West Wallsend took the lead through a dubious penalty, and added a second minutes later when a defensive mix up gifted them a goal. In a second half in which both teams were feeling the heat, Singleton had the better of it with Joe Civello and Toby Morrissey both spurning great chances to score, but the fulltime score remained 0-2. The First grade fixture was a shortened and modified game and both sides struggled to find fresh players in the heat of the day. But it provided the highlight for those spectators who had braved the conditions as Singleton’s holding midfielder Ryan Hartwell scored a very early contender for goal of the year with a screamer from 35 metres. 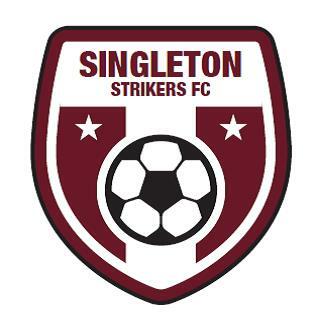 Singleton soon doubled their advantage when the prolific Nathan Hall slotted in the Strikers second goal. West Wallsend did manage to pull one back through a long ball which caught Singleton square at the back, but Singleton’s new skipper Stuart Plant was rarely troubled in goals for Singleton who run out comfortable 2-1 winners.